Microsoft has updated Cortana to add native support for the iPad. This comes two years after Microsoft released Cortana for iPhone, which makes you wonder why it’s taken the company so long to invite iPad owners to the party. Still, better late than never. Cortana may not be as glamorous as Siri or as friendly as Alexa Siri vs. Alexa: Which Personal Assistant Is Better? Siri vs. Alexa: Which Personal Assistant Is Better? The answer to "Alexa or Siri?" is likely going to depend a lot on your personal needs and opinions. We've come up with a head-to-head comparison in the areas that matter. Read More , but Microsoft’s digital assistant is still a force to be reckoned with. Cortana is already installed on millions of PCs around the world, and she’s now available on iPad as well. Meaning there really is no escape. 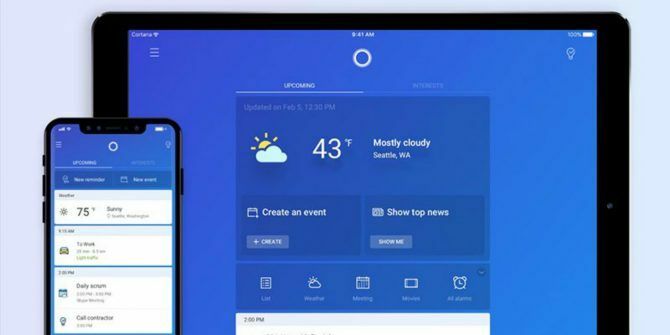 Microsoft has updated Cortana for iOS to add native support for the iPad. However, despite Cortana for iPad taking over two years to arrive, you shouldn’t expect much in the way of differences between the iPad version and the version you have installed on your iPhone. Essentially, Cortana has been optimized for the bigger screens sported by the iPad. So, it still looks the same as it does on the iPhone, but it makes better use of the space available. And that goes for all sizes of iPad, from the iPad mini (7.9-inches) to the iPad Pro (12.9-inches). Microsoft must be frustrated as hell that Cortana gets ignored when people describe the race to dominate voice control as between Alexa and Google Now. Cortana is on PCs everywhere but doesn't get much airtime. Beyond that, in the release notes Microsoft suggests that “Cortana now launches 20% faster,” enabling you to “enjoy a lightning-fast experience.” Which could save you precious seconds when asking Cortana, “Where is the nearest KFC?” when you’re feeling peckish. You can use Cortana to deliver news updates, set reminders, schedule calendar appointment, and much more besides. Unfortunately, and as noted by MacRumors, due to the nature of Apple’s walled garden, Cortana can only be used in the app itself, remaining cut off from the rest of iOS. Thanks to Microsoft making it an integral part of Windows 10 Cortana in Windows 10: Everything You Need to Know Cortana in Windows 10: Everything You Need to Know The digital assistant Microsoft Cortana is an integral part of Windows 10. Do you wonder what Cortana can do or how to turn Cortana off? We've got answers. Read More , Cortana should survive the forthcoming war between the digital assistants. However, Microsoft knows it needs to make regular incursions into enemy territory, which is why Cortana is now available on your iPad. Do you regularly use Cortana? If so, do you use her in Windows 10 or on another device? Can you see yourself using Cortana on your iPad? Do you prefer Cortana over Siri and Alexa? If so, why? Please let us know your thoughts in the comments below! Explore more about: iPad, Microsoft, Microsoft Cortana.